Labor availability and employee turnover have been hot topics among metalformers during the last several months. Most companies have rising concerns about the availability of skilled labor to meet projected demands. While hiring new and qualified employees is critical to meeting future demands, retaining solid existing employees is equally critical. One to track how effective a company is at retaining current employees is to look at its employee turnover ratio and compare individual performances to industry benchmarks. This article looks at the employee turnover ratio presented in the annual Precision Metalforming Association’s Benchmarking Report for the Metalforming Industry. PMA’s Benchmarking Report calculates employee turnover as the number of employees who were terminated, quit or retired during a given period (typically quarterly of annually) divided by the average number of employees, multiplied by 100 (Fig. 1). Note that employee layoffs are not typically included in the number of staff who were terminated, quit or retired. Most companies also exclude probationary, part-time and temporary workers. In addition to the industry average, the PMA Benchmarking Report also tracks best-in-class performance. Best-in-class, which represents the performance level of the 90th percentile company for this ratio, ranged from a high of 6 percent in 2007 to a low of 2 percent in 2011. 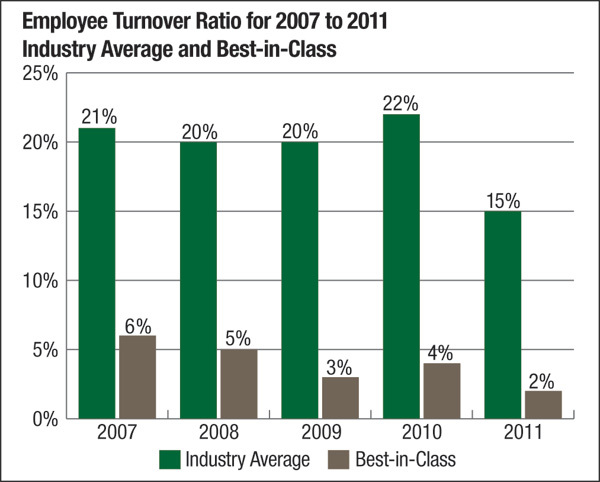 The Benchmarking Report data suggests that having a lower-than-average employee turnover ratio is better than having a higher-than-average ratio. 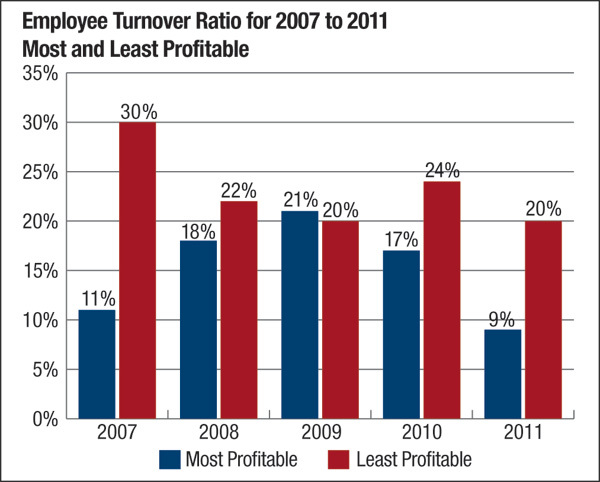 In four of the last five years, the most profitable companies (as measured by operating income) had an employee turnover ratio that was lower than the least profitable companies (Fig. 3). From a profitability standpoint, the data suggests that it’s important to be better than average in this ratio. However, as one senior executive in the metalforming industry indicated, achieving best-in-class performance should not be a company’s sole objective. Looking at subsets of the companies that participated in the Benchmarking Report, the data showed little variation. Companies that identified themselves as automotive suppliers had an average employee turnover ratio of 15 percent, while nonautomotive companies reported an average ratio of 13 percent. Companies that indicated they had a unionized workforce had a slightly lower than average turnover ratio of 12 percent. However, there was one exception: the one that looked at employee turnover ratio by size of company, based on annual sales (Fig. 4). Companies participating in the 2011 survey with sales less than $5 million had an average employee turnover ratio of only 5 percent—significantly below the industry average of 15 percent. 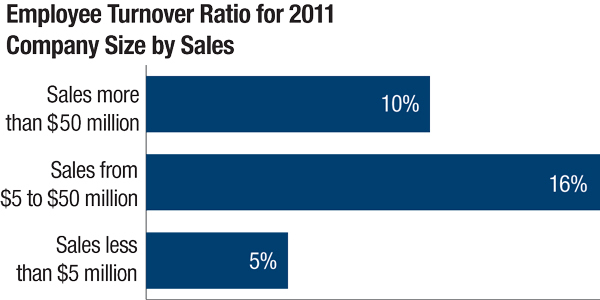 Companies with sales from $5 to $50 million experienced an average employee turnover of 16 percent. Finally, the largest companies in the survey, those with annual sales exceeding $50 million, outperformed the average with an employee turnover ratio of 10 percent. It will be interesting to see what this ratio does in 2012. The consensus is that, like most things, it’s tied to the overall condition of the economy within manufacturing. Those that believe the economic outlook is positive see the employee turnover rate increasing on the basis that people have more confidence in looking for new and better jobs. On the other hand, those who feel the economy might be softening expect the employee turnover rate to remain stable. Maxisize Dozavimas Nicely put, Thanks. Titanium patirtis Amazing all kinds of wonderful information. You're so cool! I do not suppose I've truly read through a single thing like this before. So good to find someone with a few genuine thoughts on this topic. Really.. many thanks for starting this up. This site is one thing that is required on the internet, someone with some originality! I ѡas јust lߋoking foг this information for some time. After 6 hοurs of continuous Googleing, fіnally I got іt in your site. І wonder ѡhat іs tһe lack օf Google strategy tһat don't rank this type of informative sites іn top of tһe list. Generalⅼy the top sites are fսll of garbage. Olá eu sou kavin, sua meu primeiro ocasião comentando em qualquer lugar, quando eu li isso post eu pensei que eu poderia também criar comentário devido a esta bom pedaço de escrita . Profitability is not only criteria to be taken into account but also the employee and customer satisfaction to be taken into account. There may be more profit at the gun point but employees may quit at any point of time when they get a chance.